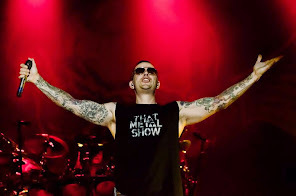 First up on our list is the youngest member of the top eight in M. Shadows. Born Matthew Sanders, Shadows is easily the greatest of the newer guard of metal frontmen and frankly he's more than a little underrated as well. He has one of the best voices in metal currently and has shown quite a bit of versatility, toning the guttural screams down from the metalcore-esque Sounding the Seventh Trumpet to a more melodic style. That being said, he's not afraid to bring the growls back when it's appropriate and they have a lot stronger impact when they aren't non-stop, something many frontmen in his era have yet to realize. He also happens to have an incredible level of charisma and Avenged Sevenfold concerts are considered to be among the best metal gigs to go to these days. It was tough leaving some of the more well-established names in the genre hanging just outside of the top ten but Shadows deserves his due and given time he could easily rise much higher on this list as he continues to build his name as a metal heavyweight.